*IMPORATANT NOTICE* Processing time is TEMPORARILY up to three weeks on ALL items, including ready to ship items. This extended processing time is to allow me to visit family for the holidays. I will be away from 12/26 until 1/04. When I return orders will be processed as quickly as possible. I will not be doing any RUSH orders. This is also advertised in the shipping section of my listings. Thank you so much for visiting causticthreads.com! 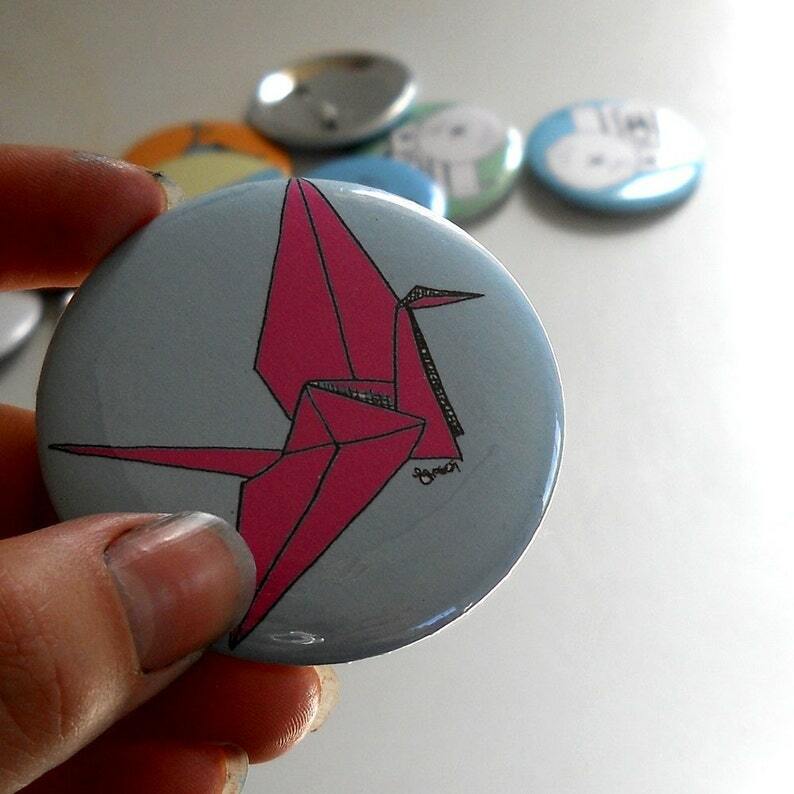 This listing is for ONE origami paper crane button inspired by the Japanese legend that anyone who folds 1000 paper cranes will be granted a wish. When I was young I was really touched by the book Sadako and the Thousand Paper Cranes, and was recently reminded of the legend when some friends folded 1000 paper cranes for me after a disappointment in my life. There is much more cultural significance for 1000 paper cranes. They are often given as wedding gifts or as gifts for new babies, too. The diameter of this button is 2 1/4 inches. Plus! buttons are SUPER FUN! we all need a little flair. I package most orders in a screenprinted bag. Please note, the print on the bag will vary. If your order is too large to fit in a screenprinted bag it will not be shipped in a screenprinted bag. Items are not individually packaged generally, please notify me if you would like additional bags or items to be individually wrapped and I will do my best to accommodate. Any photos of packaging are only an example.